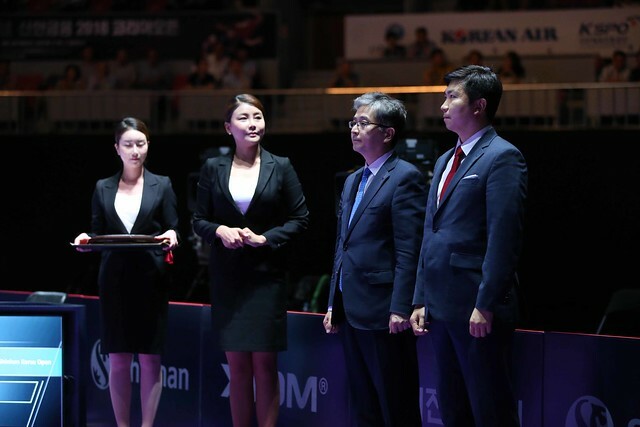 Winner one day earlier of the Under 21 Men’s Singles event, when he had thwarted the challenge of Japan; as play commenced in the opening round of the Men’s Singles event at the Seamaster 2018 ITTF World Tour Platinum Shinhan Korea Open in Daejeon on Thursday 19th July, once again DPR Korea’s Ham Yu Song proved the nemesis of the Land of the Rising Sun. Required to compete in the two day qualification tournament, he beat Kenta Matsudaira, the no.11 seed, in a round that proved most fruitful for the Korean Peninsula. Not only did Ham Yu Song upset the seeding, so did the host nation’s Jeong Sangeun and Jang Woojin. Jeong Sangeun, who had lost his very first match of the tournament when beaten in the group phase of the qualification event by Yuta Tanaka (6-11, 9-11, 11-4, 6-11, 11-7, 12-10, 11-8) and had eventually secured first place in the group courtesy of games ratio, both extracted revenge on Japan and caused the visiting nation more anguish. He accounted for Koki Niwa, the no.6 seed, in six games (10-12, 11-5, 10-12, 11-8, 12-10, 11-7). A fine performance from Jeong Sangeun but if any Korean impressed it was Jang Woojin; he overcame Germany’s Patrick Franziska, the no.16 seed, in four straight games (11-6, 12-10, 12-10, 11-9). Scintillating from Jang Woojin, it was the same from colleague, Lee Sangsu. The no.5 seed, he showed Portugal’s Tiago Apolonia no charity; a straight games win was the order of the day (11-8, 11-7, 11-3, 11-8). Disappointments for Japan; but there was success, in an emphatic manner, Jun Mizutani, the no.10 seed, beat Singapore’s Gao Ning (11-6, 11-4, 11-4, 11-3), Yuya Oshima accounted for colleague, Jin Ueda, the no.14 seed, in the closest match of the round to date. He emerged successful by the minimal two point margin in the decisive seventh game (13-11, 6-11, 11-9, 9-11, 11-7, 6-11, 14-12). Notable defeats for four seeded players in the top half of the draw in the opening round of the Men’s Singles event. However, there were no great moments of anguish for Germany’s Dimitrij Ovtcharov, the top seed, nor for China’s Xu Xin, the no.3 seed. Dimitrij Ovtcharov, on his return to international action, beat Frenchman, Enzo Angles (11-5, 11-8, 11-9, 11-8); Xu Xin defeated Masataka Morizono (12-10, 12-10, 11-3, 12-10) to cause Japan more heartache. The lower half of the draw in the Men’s Singles event plus the whole of the second round will be played on Friday 20th July.